It's August 1st and this is the month where I am the featured artist on the website for "The Judges Choice Equine Classifieds". It was nice of them to ask and I was happy to oblige :-). 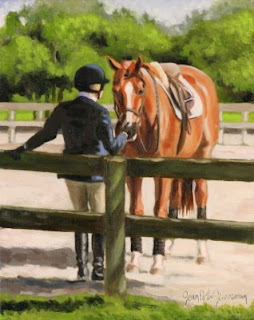 I have shown here my painting entitled "Breaktime" which is one of the images that they show on the website. I painted this one because I was really attracted by the rider in shadow and the horse in the light. They also show that common activity between classes.....just taking a break and resting up for the next activity. The way the rider kept her hand on the horses muzzle just reminded me of that special bond between these two teamates. This painting is in the collection of Ms. Ellen Johnson of New Jersey.